We have a lot of inventory made and ready to be sold. Fill out the form below or send an email to president@kelsoband.org to request your Kelso High School Marching Band Pillows and *NEW* Wall Hangers. We will also be at the Kelso home football games if you would like to come by and purchase items. If you have already placed an order, your items will be ready soon. You will receive an email when your items are available and to make arrangements for payment and pick up. Thank you everyone for supporting our program! Do you remember the uniforms that the Kelso High School Marching Band wore from the early-1990's until 2010? Did you perform in what former KHS Band Director Craig Gustafson called, "Giant musical blueberries"? Well...THEY'RE BACK!...sort of. We have pulled these old uniforms out of the depths of the band closet and are giving them new life...in the form of KHS Pillows and *NEW* Wall Hangers! These will be great gifts for any Kelso High School fan, and especially for former band members who had to sport these gems. 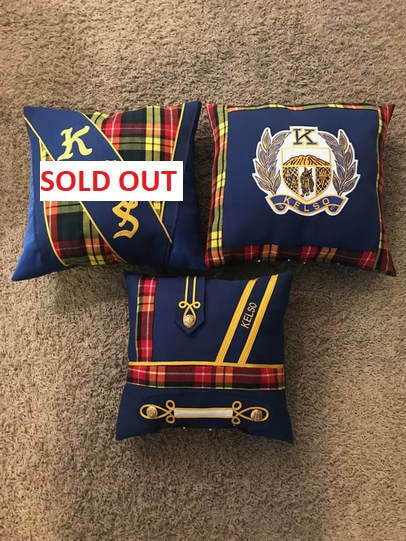 Below is an image the three different pillows: "KHS" (SOLD OUT), "Crest" and a "Custom" design made up remaining material. These pillows will have a custom look and most of them will be slightly different. The price is $50 each for the pillows and $45 for the wall hangers (image coming soon). We are not taking any money now - you will pay upon pick up (cash or check only). Because we know the demand will be great, we are asking that people interested in purchasing a pillow complete this online form so we can track it as efficiently as possible. We will be making these pillows in batches as our great volunteers are able to produce them. When your pillow is ready, we will reach out to you and let you know where you can pick it up and pay for it (most likely KHS events such as football or basketball games). We will not be shipping these out, so if you live out of the area please coordinate with someone to pick up and pay for yours. This is first come-first serve, but please let us know if you need it before a certain date. We will try to meet those requests, but no guarantees. All money collected from this fundraiser will go to the Kelso Instrumental Music Boosters to support the instrumental music and Winter Guard programs at Kelso High School. This is a limited time item - when we run out of uniforms then that's it, so please do not wait to get on the list. Please be patient as we crank the merchandise out - We know you will love them!